Dr Surinder K Jindal joined Jindal Chest Clinics, Chandigarh, after superannuation from PGIMER on April 30th, 2014. 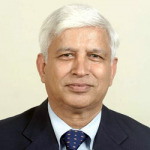 He is a distinguished medical teacher and clinician who headed the Department of Pulmonary Medicine at the Postgraduate Institute of Medical Education & Research, Chandigarh, India from 1988 to 2014. He got the department recognized as a WHO Collaborating Centre for Research and Capacity Building in Chronic Respiratory Diseases in 2008-9. He had introduced the post-doctoral (DM) course in Pulmonary & Critical Care Medicine in India for the first time in 1989. With over 40 years of experience, he has guided and mentored a large number of pulmonary physicians and other trainees now occupying prestigious positions in different hospitals and institutions both in India and abroad. He is the current Editor-in-chief of Chest India.